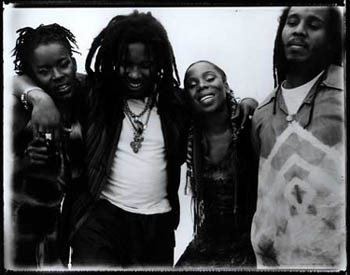 Heavy words like heritage and legacy are often used when the subject is Ziggy Marley and the Melody Makers. As Bob Marley's children, the band will always be associated with their father's towering presence as both a musician and cultural icon. And this is how it should be. To resist this association would be to deny the musical and spiritual blessings and heritage that have flowed from Bob to his children in what has truly been an extraordinary natural progression. The Melody Makers are building upon the foundation I and I father started. They have forged a sound all their own, incorporating international contemporary musical forms without losing an essential roots reggae sensibility. As Ziggy has said, "Bob stuff is unique. Melody stuff is unique." Since their debut as young teenagers until their present incarnation as a seasoned and highly professional band there has been one constant: great songs. From "Tomorrow People" and "Tumblin' Down" to "Everyone Wants to Be", the hits keep coming from what is still a relatively young group of musicians. After eight acclaimed albums, two Grammy awards and sold-out concerts before tens of thousands, the Marley magic continues to spread. Perhaps it is because this is message-music. Ziggy and his siblings live in a different time from their father, and this reality is reflected in their work. Without preaching or proselytizing, the Melody Makers sing about the world as they see it and as it could be. They sing about African peoples and their history, but the music doesn't carry a message of exclusion or retribution. And as they comment on the human struggle and problems and tribulations that face us all, the Melody Makers never lose sight of the fact that music is a celebration. Words like optimism and positivity are often used - and used correctly - when people describe their music. The Melody Makers' gift has been to inspire and uplift in a conscious party that, as fans, we hope will carry on well into the next millenium. Catch phrases like "one love" and "one world" seem less like fantasy and more like possibility when the Melody Makers are in town. Ziggy sums it up like this: "The revolution is still alive and the youth, them have to know that."